I’ll be publishing the last post in the Dimensions of Destiny series on Friday, but for today, due to some things that are happening in my life right now, I wanted to talk to you about when God comes suddenly. Have you ever noticed that God has a habit of showing up on the scene of your life in huge ways out of nowhere? I have seen this time and time again … and often, God comes suddenly just after you’ve given up on a thing. It was that way for me when I got married. Before I began dating my husband, I had been lonely for years. All I wanted was a husband. But I had finally decided that I was content to be single and didn’t need to get married. After years of waiting and wishing and hoping, the Lord has finally just brought me to a place where I was receiving my fulfillment from Him. Then, out of the blue, my now-husband asked me out. And exactly seven months (to the day!) from our first date, we were walking down the aisle. It’s been over nine years, and we’re as happy as can be. 🙂 Papa knew best, and He showed up, even though I didn’t expect Him. God loves to come suddenly. The early believers had been praying for fifty days for the outpouring of the Holy Spirit. I don’t believe they knew what the timetable was. They were simply obeying Jesus, who had commanded them to remain in Jerusalem until the Holy Spirit was poured out. Put yourself in their place and imagine what that must have felt like. They had a promise from Jesus, and they had each other, but they didn’t know when the promise would be fulfilled. So all they could do was stay in unity and pray. And wait. And wait. And pray. And then one day … BOOM! “Suddenly” happens. The Holy Spirit was poured out. Every believer was filled, and they began to operate in the gifts of the Spirit. People were radically transformed in one moment, and their lives were never again the same. It happened suddenly after a long time of waiting. It happened without warning. SUDDENLY, God came. Papa God has a habit of showing up suddenly, and He’s still doing it today. You may have some dreams you’ve waited for a long time. You may have even given up on some things, or simply become content without your dreams. And that’s not necessarily a bad thing, if you’ve settled into a godly contentment where you receive your fulfillment from Jesus instead of from the thing for which you’ve been waiting. I felt led to tell you today to watch for God to come suddenly. You may have forgotten about your dream, but Papa hasn’t forgotten. You may be happy the way you are, but Papa has more. 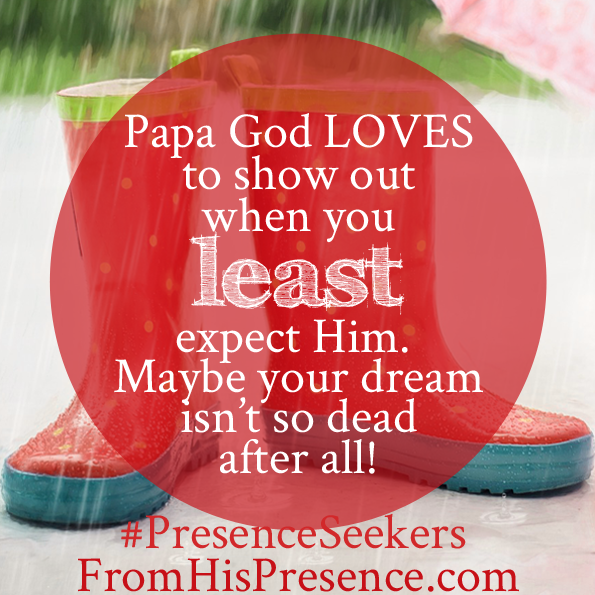 You may be content to keep doing things the way they’ve always been done, but maybe Papa has a new plan. I don’t know what His new plan is. I don’t know what His dreams for you are. However, I do know that He loves to surprise you. He loves to do exceedingly abundantly above all you could ever dare to ask, hope, or think (Ephesians 3:20). And He ALWAYS has something up His proverbial sleeve. So watch. Pray. Ask Him what He’s up to, and ask Him for more than you’ve ever dreamed. Ask Him to surprise you, and watch Him do it. You might receive more than you ever dreamed you could receive. Papa’s just a good Daddy like that. Thanks Jamie – that was mightily encouraging! And yes, it really spoke to my situation as it is right now – and has been for nearly 30 years. But I still believe that, one day, it will surely happen just as the Lord has promised. It doesn’t sound silly at all, Carol! Glory to God! Thanks for the message for today,it speaks to me directly and I’m going to wait expectedly for God to show up in my life in a Big way. When He comes upon my life I believe I will be filled with His awesome Spirit. God worked suddenly in my life today! I have not had a job since Sept 2013. I got a job with a lot of potential completely out of the blue. Praise His Holy Name! Great inspiration for the day. he has done it several times to me out of the blue. thanks i knew it was Him coming to my demise! Thanks for this! i believe he is still to do more!! Yes I’m also believing God for a job. I know He is going to surprise me and give me one at the right time. I’m so happy for you! ?God is so awesome! This has blessed and encouraged me today. After 40 years of ministry I am still waiting for his suddenly to fulfill prophetic words spoken over me. Thank you for the message, it speaks directly to my heart, knowing that my prayers for many years are not lost and God can still say something. The message encouraged me not to give up on my dreams knowing that God will show up when I least expect Him and He will do greater and mighty things for me and that moment my life will turn around for His goodness so His Holy Name will be glorified and exalted above all creation. All will happens in God’s time and I will tarry for God’s time. Thanks for those encouraging words. I’m still believing God is going to show up and show out in my life. Thanks so much for this. I receive it! It really spoke to my heart and it was right on time. Thanks for truly listening to God and being obedient. Okay, this is bizarre. I had already started my work day, and got convicted because I hadn’t prioritized any Bible study, confessions or devotional reading first. So, I put on my “Schmoove” iTunes mix of music and decided to put the song “Suddenly” by Olivia Newton-John and Cliff Richard on repeat. It’s just a pleasant, calming song for me, and it helps me relax while working. Reminds me of the simpler, good days of my childhood. Yeah, it’s a ballad, but I serenade Daddy with ballads all the time. I then clicked on your post and almost fell over. A post on our ‘Suddenly’ God? While I’m listening to the song “Suddenly” on repeat? Really? Thank you, Jamie. Thank You, Holy Ghost. Message received. 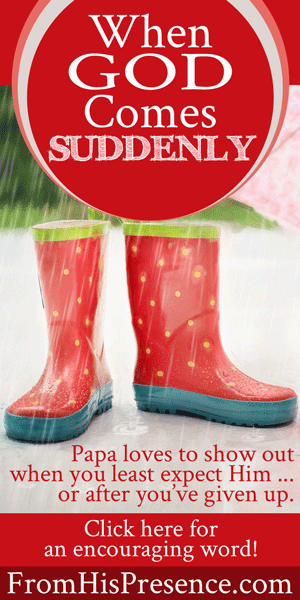 I love how the “Suddenly” concept has been driven in for you today. And as always, thanks Jamie, for this post. I so love you Jamie! I believed that Papa God is talking to me thru you. This message is so for me! I claim it! I was passed on for a promotion, it was my dream position. I have given up! But somehow, deep inside me, still believing that God has a much bigger plan for me. I will continue to hang in here, He may just show up SUDDENLY! This is exactly what God put in my heart today as well! Thank you for blessing me! What a great post! I know He wants restoration in the body of Christ. Prayers are being answered. I am encouraged to see the comments about waiting a long time, if you are like me, you probably just missed it along the way, or the enemy got between you and your promise someway in spiritual warfare. Pray in the spirit, He will direct you. Ann, I’m praying for you and Carol today, 40 years of ministry is amazing. Thanks Rebecca – your prayers are much appreciated! God bless. Thanks for sharing! I will not give up on my dreams. I believe that GREATER is coming! I am waiting for the big SURPRISE that God has for me. God Bless!! Thank you for posting this. We are actually waiting on a few answers, but we will be content and trust him regardless..God Bless you! Hi Jamie! Wow. Now this is a message our Father truly wants me to hear! My home church is studying Acts right now. Yesterdays devotion was Acts 2: 2-24. Not a coincidence. I know this is Papa God at work. I will be praying and meditating on these words. I feel this message has been shown to me again within 24 hrs so that I may study it and fully understand it for my life and share it with others who also struggle with what feels like unanswered prayer. Thank you Jaime. God Bless you as you continue to do Gods work. I thank God for using your life to became a tool to bless people and to be honest,,YOU ARE REALLY GOD’S VOICE…to His people,, the word “suddenly” was something that the Holy Spirit was laying in my heart,,i have always been inspired and encouraged by the life of Paul & Silas while they were praying and praising God, SUDDENLY there was a violent earthquake. I totally believe that God is preparing something HUGE for the body of Christ….we really have to be prepared for that GOD’S SUDDENLY. GOD is good all the time. HE comes suddenly because HE likes to show us HIS power. HE reminds us that HE is our Father and that if we need something we need to ask HIM for it. I am secure in this knowledge because there is no question of where the gift comes from. HE wants us to fully rely on HIM and rightly so. HE is my Dad. Knowing all that I’ve written in this comment above, l sometimes forget these things. Thank you for the reminder. I sometimes need to be reminded daily. We have to be assured that God remembers his word. That is a very good word and I am laughing as I read it. God does come suddenly and I believe He loves to surprise His kids. Expectation rising.